Remember when I posted about my amazing new bamboo chair and I told you that it was one of my lovely readers who emailed me because she knew I was looking for one? Well....she also happens to be one heck of a seamstress and whips up the most beautiful throw pillows I've seen! Her store, Lily on Blue, can be found on Etsy. I mean what are the chances to not only get a new chair, but also a new friend AND one who sews? I mean it doesn't get any better than that! So here is where my good fortune can become your good fortune too. Eileen is generously giving way one throw pillow cover to one of my lovely readers! We settled on the theme of Chinoiserie and you get to pick 1 of the 4 beautiful choices. Pillow #1: Kravet Couture Silk Chinoiserie 18x18 Pillow Cover. Pattern on Both Sides & Zipper Closure. Pillow #3: Schumacher Shantung Silhouette 18x18 Pillow Cover. Zipper Closure. Pillow #4: Schumacher Chiang Mai Dragon 12x18 Pillow Cover. Zipper Closure. 2. Visit Eileen's store, Lily on Blue. BONUS ENTRIES: Tweet or blog about this giveaway and you get an extra, or two, entries. Don't forget to come back and comment again for each extra entry. Giveaway ends on May 8th and is limited to U.S. residents only. The winner will be chosen by random.org. Just use the code LEB20OFF at Lily on Blue for an additional 20% off your order, woohoo! Ok lucky you to find such a talented friend! My favorite pillow on Lily on Blue and out of the 4 is the Chiang Mai Dragon 12x18 - have just the spot for it. I am a follower of your blog - love it. I'd pick #2. It's so bright and cheery! I visited her etsy shop and I'd choose the Braemore Wonderland Floral. Braemore is my new favorite line! I just discovered it recently and I love everything they make! From her store, the imperial trellis. I'm still such a sucker for that pattern. But if I when, I would choose #2. And I'm a follower, of course. I follow your blog and visited the etsy site. Gorgeous pillows! I like the Trina Turk orange pillow and would probably choose the Chiang Mai Dragon in the giveaway. I love the vintage tulip pillow cover! I would choose #3 or #4. I love them all but I would choose #3. I just visited her store and I would love the Braemore Wonderland Floral pillow. Such wonderful colors! Of course I am a follower. I am a Chiang Mai Dragon kind girl. I just visited Lily on Blue and my favorite cover was the Richloom Santana Ikat Suzani. The colors are beautiful. I would choose the Chiang Mai Dragon cover - it would be the perfect addition to my living room! My favorite pillow in her shop is the Jane Shelton faux bois. Of the four above, I would choose the Chiang Mai and give it to my sister who has been wanting something in that pattern forever! The braemore wonderland pillow is so pretty! If I won, it'd be a toss up between #2 and #4! Def #3 Shantung Silhouette! Im a follower via RSS feeds. I love Kravet Windsor Smith Pelagos pillow cover from her Etsy shop! For the giveway, my favorite is number #2. It would look great in my living room! I would love to win the Pillow #4: Schumacher Chiang Mai Dragon for the giveaway. If I did, I would pair it with the Trina Turk Santorini Pillow Cover! My favorite is the Schumacher Shantung, but if I won I would choose the Chiang Mai Dragon! I love the Schumacher Chiang Mai Dragon. The colors are my favourite. I am regular follower of your blog. Thanks for the giveaway. Great giveaway! I'm an rss follower, still looove #4 it just helps make a room! My favorite pillow is the Schumacher Shantung Silhouette but if I win I would pick the Chiang Mai because I have the perfect spot for it! I have to say, I'm loving all of her gray pillows, so beautifully neutral. So I think my pick from the four above would have to be #3! I like #3, I am still not tired of gray! I follow your blog. I adore the Schumacher Katsugi pillow on Eileen's site. I'll choose the Chiang Mai-- I'm still a big fan of it! I really love all of the pillows in Eileen's Etsy store but if I had to pick a favorite I would say the Braemore Silsila Suzani Pillow Cover 18x18 is my favorite and it would look awesome on the chair in my bedroom. Wow, these are really beautiful. My favorite from Eileen's store is the Designer Vintage Tulip Pillow Cover. I love the red welting. If I won I'd pick #4, I love the dragon and the bright colors AND the shape! Thanks. Love the Romo Rubani in Red and pillow #2! So fun!! I'm a follower! My favorite of all of her pillows is the Trina Turk Santorini! So classic! Of the four listed, I would choose the Schumacher Arbre Chinois! Pretty! My favorite in the store is the red Ikat and I would love to win the Chang Mai drago pillow. I love P. Kaufmann Suzani Pillow Cover(18x18 Aquamarine). All 4 are great, but I think I wold choose #4. Happy Wednesday! What a fun giveaway :) My favorite LilyOnBlue pillow cover in the store is the Richloom Santana Ikat Suzani, and i would just LOVE to win the Schumacher Abre Chinois cover-- would be a great addition to my bedroom! I love the Richloom Santana Ikat Suzani pillow -- and I'd choose #2 from the above selection! I follow with GFC. I would pick pillow #2. My favorite pillow in her shop is the Romo Rubani Floral Pillow Cover. I also love it paired with the chevron striped pillow cover in her listing. Ohh I love these pillows! I am an rss follower. I would pick #4 from the pillows above and my favorite from her shop is the "Celerie Kemble Hot House Flowers Pillow." Oh and her site...hothouse flowers by Schumacher are fantastic!!! So many beautiful pillows!!! Beautiful!! I like the P. Kaufmann Suzani Pillow Cover the best and I'd choose #4 from the pillows above. But really, they're all gorgeous! I really like that Kravet Windsor Smith Riad Pillow Cover and if I won I'd definitely go for #4. Such a great print and the size is cute! Love the blog and the generosity of Lily on Blue to tell you about the gorgeous Bamboo chair! On her etsy site I am drawn to the Duralee Red Ikat Pillow Cover. For the give away I'd have to go with Pillow #4 it would be the perfect start to my living room re-design. I'm a follower of everything LEB. Out of the four options I would pick the Schumacher Chiang Mai Dragon 12x18 Pillow Cover. 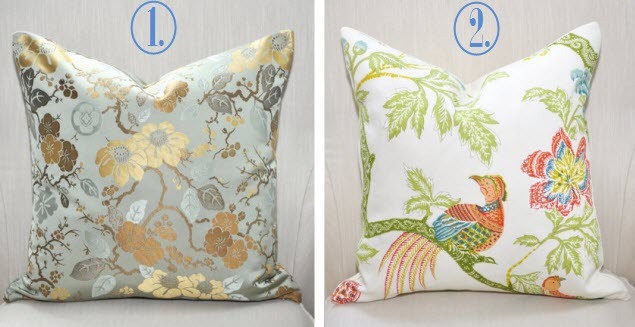 I love Kravet Jellybean Floral Pillow Cover -- 18x18 on etsy, but #4 is my favorite of the choices here. I am a follower of your blog-love it! :) My favorite pillow on Lily on Blue as well as for the giveaway is #4, Chiang Mai Dragon. Beautiful colors! I follow your blog and love it--so inspiring and FUN! Visited LilyOnBlue. my favorite of her etsy listings is the vintage tulip pillow cover (M. Lowenstein& Sons). My giveaway pillow of choice would be #4 (Schumacher Chiang Mai Dragon). Thanks to Lindsay and Eileen for the great giveaway! Number 4 would be perf in my living room! I have a love affair with that hot house flowers pillow on her site, but if I won I'd be head over heels for chiang mai #4! From the shop I like the Kravet Jellybean Floral, and out of the four above #1 is my pick. Thanks for the chance to win something so nice! Love all her pillows but the Richloom Santana Ikat Suzani Pillow Cover is my fav! I think I would pick #4, but I also love the Santorini pillow on her site. I'm digging on #4, thanks so much! I am loving the Braemore Wonderland Floral Pillow Cover and from the selection I would love to own the Schumacher Chiang Mai Dragon to add a pop of color to my living room! Hi, follow your blog in my reader, Without a doubt I'd pick #4!!! But I do also like the Ikat she offers too! Thanks! Woohoo! I've been needing some Chiang Mai Dragon in my life, so winning that pillow would make me quite happy. :) From her store I would go with Hot House Flowers - so gorgeous!! Love the blog! (and my name is Lindsey B too). From the website, Imperial Trellis. Above, I would pick 2 but 3 is also awesome. I love the Schumacher Arbre Chinois - both above and on her site! Wow - it is so beautiful! Currently designing my wedding colors/palette and trying to make it quite chinoise! Your blog is wonderful too highlight of my morning! Pretty, pretty pillows! I love the hothouse pillows on her site. If I won, I would for sure pick the Chang Mai dragon pillow. It's all around the blogosphere I know but my living room is orange and aqua. Love the Schumacher Katsugi for the giveaway adore the Shantung Silhouette!! Oh yes I am a follower!! I'm a follower (erinnicole14)...and I absolutely ADORE your blog! As for the pillows...I'm having a hard time deciding between #1 and #2, I think I'm leaning towards pillow #1 though. LOVE the Braemore Wonderland and the Celerie Kemble Hot House Flowers for Schumacher- they are both beautiful! Yes, I am a follower and love your blog. I forgot to mention - out of the four options I would choose #4- the Schumacher fabric. Great giveaway!! I would love Pillow #4 but also love the Celerie Kemble Hot House Flowers Pillow Cover from her shop! I'm your follower! I love the imperial trellis pillow! And I'd choose the chiang mai dragon. Fabulous giveaway! I'd love the Chiang Mai Dragon pillow for my bedroom... and in her awesome shop I adore the Trina Turk Santorini pillow! Following and loving your blog! For the giveaway Pillow #3:Schumacher Shantung Silhouette. Yay! I'm a new follower. LEB is such a lovely shop! I had a difficult time choosing because I wanted to scoop up everything, but the Braemore Diamond Geometric Pillow Cove would look great on my couch. The Chiang Mai Dragon 12x18 Pillow Cover is also just about the most amazing pillow I've ever seen, and I'd love to win it. Thanks for the chance! Windsor Smith Pelagos in gray/white is a fav of mine! The dragon or silhouette are both amazing! Thanks for a great giveaway! Ooh how lovely! My favorite from her store is the Braemore Wonderland Floral Pillow Cover, but I'd take number 4 up there any day. Thanks for the chance! probably squeaking in at the last minute- but that gray/white pillow is fabulous. modern & oranate collide. :) i love this and can't wait to mosey on over to look through more of the lily on blue site! Kind of loving them all, but am gravitating towards the Richloom Santana Ikat Suzani Pillow. Of the 4 above, I'd definitely go for the Chiang Mi Dragon pillow! Fingers crossed! Hmmmmm...I'm torn between #1, 3, and 4! I think at the end of the day I would go with #4 just because its so dang colorful! And I'm a sucker for gold and gray so I'd go with the Schumacher Katsugi pillow!